Missouri GOP Rep. Rick Brattin still doesn’t buy that whole evolution thing. Indeed, Brattin is the latest politician to seek to make science conform to religious beliefs by introducing bills that would force creationism into science classes and make “intelligent design” theories equivalent to evolution as a scientific subject. 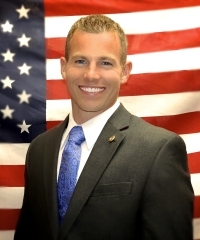 Brattin has proclaimed in this district that he would work to stop the “slow erosion of our God ordained liberties and freedoms.” That apparently begins by ordering “God-ordained” science for Missouri children. By the way, Missouri is already ranked 41st out of 50 states in school quality. Brattin appears committed to beating South Dakota for the distinction of the worst school system in the nation. Students will now receive education in the three rs: reading, ‘riting, and religion. (c) If scientific theory concerning biological origin is taught in a textbook, the textbook shall give equal treatment to biological evolution and biological intelligent design. Other scientific theory or theories of origin may be taught. The tortured language is an effort to avoid the word “creationism” and to dress up religious beliefs as scientific theory while treating evolution as a philosophy. The bill would recreate “standard science” in a more faith-based image and guarantee Missouri will fall further in its educational rankings. What is clear is that the drafters may be the best argument against evidence of evolution. The law is poorly crafted and both intellectually and politically dishonest. It is little more than to legislate that science teachers will legitimate religious views despite the overwhelming support for the fact of evolution. I have a petition AGAINST that!! Please sign and share like crazy: http://signon.org/sign/rick-brattin-and-the We’re already OVER 5,000 signers and organizing to hand deliver!! I have a petition for that!! Please sign and share like crazy: http://signon.org/sign/rick-brattin-and-the We’re already OVER 5,000 signers and organizing to hand deliver!! Maxcat, I have to give attribution. I read a children’s story once long ago, and have since hunted for it for years in vain and never found it again. It was a sort of modified “Just-So Story” about how whales were made. It said that God was growing vegetables in his garden in a cliff above the sea, when he noticed that one of the eggplants was a-growin’ and a-growin’ and a-growin’ way way too big for what it shoulda. So he told it to stop a-growin’ so big but it just didn’t listen and kept a-growin’ and a-growin’ until he got into a fit of pique and snatched that big old eggplant off its stem and punched a hole in it and threw it OVER THE CLIFF and into the ocean, where it turned into a whale and would bob up and down in the ocean forever coming up to spray all the salt water out of that hole in its head. So whoever wrote that story, kudos! 10 years in science education – not in science !! Evolution does not discuss ORIGIN – it discusses the variations, species, changes, etc. Abiogenesis discusses orgination. They are not the same thing at all. For cryin out loud – just say “GodDidIt” – creation – and get it over with so we can get on with asking you for any proof whatsoever. The Bible isn’t proof – it’s a claim with no supporting evidence. You may have FAITH or you may have FACTS AND EVIDENCE but you can’t have both. I call BS on wise anon. Anyone with a ‘post-graduate science education’ knows first and foremost that the theory of evolution has nothing to do with the origin of life. The ToE is observations, experiments, and explanations of the many mechanisms that lead to adaption and speciation of life over time. How life on Earth changes and by what means drives that change is the only thing the ToE is used to explain. Abiogenesis is the study of how life may have originated from non-life, which can also include religious beginnings(although supernatural beginnings are by definition beyond the study of the natural world and explanations). If you can’t even get the fields of study and very clear differences in what is being discussed straight, how can you be taken seriously? Right, wise anon. Just keep telling yourself that. All you need to do is make one finding that shows the ToE to contradict the evidence accumulated by any one of the major fields of science that provide evidence for the ToE like biology, paleontology, genetics, geology, etc. or any of those field’s sub-fields. If you find a rabbit fossil below a dino fossil or any other contradiction to the major tenets of evolution you’ll be the most famous scientist in the world. Why aren’t you working on that instead of making empty claims with zero evidence as support if you’re so knowledgeable and confident? You’re not just another typical creation apologist, are you? Hope not. The world has plenty of those that are blinded by ideological faithiness. We need you to be an objective, scientifically literate member of society, not a bronze age mystic. Otter, I have 10 years post-graduate scientific education. Books have been read. The data is clear. You have not wasted your education, you just have missed out on important facts. The reason? Unscrutinized religious and philosophical ideology is limiting our education by banning legislation that allows a proper examination of all the facts of life’s origin. These bloggers/critics are just shooting themselves in the foot. Sorry about the hours in the lab…….been there. You are not kidding about sheltered life…. again, it is time to move on….. Proof positive that education doesn’t necessarily dispel closed minds and/or ignorance. You lead a much too sheltered life. There are things called books. You can find them in libraries and college bookstore. They cover subjects such as science and the scientific method. You really need to get out more and read up of a subject before pontificating about it. Empirical evidence is lacking? Really? Oh noes, 13 years of college education gone for naught because some blogger pulled an opinion out of his nether orifice. When I think of all those hours in the lab I must have wasted……. Oh wait! Never mind. Call theory what you want. You still need facts to support it. Evolution theory simply does not explain the facts in regards to life’s origin. Empirical evidence is lacking. It’s clear and it’s time to move on. Interesting, if deceptive move on your part. Making an assertion without evidence supporting it and then declaring the topic “done”………..Really? EG NJ, Josh is using standard apologetic lines without bothering to understand what he’s writing. When folks attempt to redefine how ‘scientific theory’ is used, they only expose that they can’t dispute the science. The only choice left is to obfuscate and play to others that are scientifically illiterate. Josh, you’ve only used oft repeated inaccuracies and misconceptions. Your lack of understanding and willful ignorance is apparent for all to see. Theory stands above laws in scientific terms. Your denial of this speaks volumes about your desire to ignore reality in favor of ideology. Newton developed the first generation of the ‘laws of gravity,’ but ‘the theory of gravity’ supersedes and incorporates the ‘laws of gravity’ to form the body of current and developing understanding regarding the force of nature known as gravity. The same applies for the ToE. Your continued denial and misunderstandings regarding the links I provided show your ideologically motivated bias. My links are accurate and your misunderstanding is a product of your own motivation. This is so true. For science to maintain its integrity “theory” must be used for even well-proven conceptions. I my, less than scientific, mind this is the way it has to be because there must always be an opening for new evidence to further shape the “Theory”. Josh – You clearly don’t understand science or the words used – or what you typed. Evidence means FACTS . They are not guesses they and not hopes and prayers and they aren’t made up or dismissed to suit the conclusions you want (that’s how creationism works). Theory is the DESCRIPTION of how those facts fit together. The facts do not change and by the time you get to the theory of whatever – it’s over. But – they’re just theories.. Have fun Josh ! !